It is well known that the weather in the Dallas/FW area can vary wildly from day to day. One day you are enjoying great sunny weather in the mid 70s, and the next you are being pelted with freezing hail. This weather can indeed effect your garden and its important that you take steps to prevent damage due to the extreme weather. When it gets really hot, plants can dry out easily. Make sure that you keep your plants adequately watered during the really hot days that are going to creep up on us very soon. Although along with spring comes thunderstorms. If there has been a big rainstorm, skip watering your garden. If your garden is on an automatic sprinkler, make sure to adjust it to skip a day or two to let your plants air out. Ice storms are not uncommon in DFW area. Make sure to keep an eye on the weather and if you are going to have a bad freeze, don’t forget about your garden. Cover the most delicate plants with sheets, cover any exposed piping with foam or spray insulation, and bring all pets inside. Ice storms have the potential to create havoc in your garden. 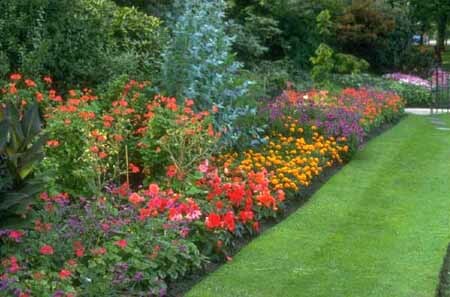 Right about now you should be thinking about fertilizing your garden in time for spring. Gather some nutrient dense mulch and there are also various brands of great top soil that you can add that will really help your garden be the healthiest it can be. A quick and easy way to help your soil is to throw old coffee grounds in with your soil. It will help prevent pests such as snails and slugs as well as adding rich nutrients to your garden. If you need assistance in getting your garden ready for the spring storms, contact Blooms Landcare at (817) 688-5352 to speak with one of our garden professionals today.